All the tools and supplies you need to clean pipes and industrial boiler tubes. We sell several pipe cleaning machines. The TCM 3000, is a light weight yet heavy duty system. high-torque electric motor that spins the brush at various speeds from 0–1750 rpm while maintaining constant torque. 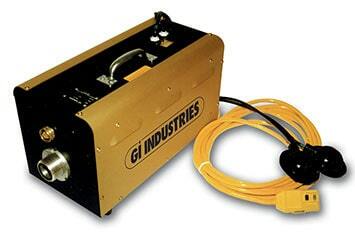 Soft-start circuit that reduces operator fatigue and machine wear, giving you more control cleaning out pipes. Removing deposits is easy with our unique air/water flushing at the drill/brush head. As the brush spins, compressed air/water is sprayed out of the brush-head to remove debris fast. Special control switch which will allow the operator to choose forward rotation, reverse rotation, or neutral for just flushing with compressed air or water.